The Independent National Electoral Commission (INEC) has fixed Saturday February 16 for the conduct of the 2019 Presidential Elections. 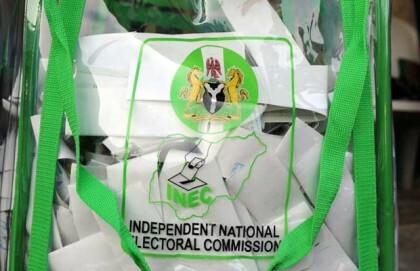 The Commission also said the Governorship/State Assembly/Federal Capital Territory Area Council Elections will hold on Saturday March 2, 2019. National Commissioner in charge of South-West, Prince Solomon Soyebi who briefed newsmen on the outcome of the Commission’s meeting yesterday said the decision was taken in order to ensure certainty in election dates and allow for proper planning. “Our democracy is maturing and the Commission believes that there should certainty with regards to timetable for elections. For instance, in the United States, general elections always hold on the second Tuesday of November in the election year. In Ghana, it’s the 7th of December of the election year while in other places like Mexico, Norway, Sweden, Coasta Rica and Swithzerland, the dates are also known in advance”, Soyebi said. This is the first time INEC is announcing dates for general elections about two years before the election year. In 2007 INEC under the chairmanship of Professor Maurice Iwu released a final time-table for the general elections in October 2006. The time-table provided for the conduct of Presidential election on April 21, 2007 while governorship and State House of Assembly election was held a week earlier on April 14 of the same year. In the same vein the time table for 2015 presidential and the National Assembly elections was released by INEC under the chairmanship of Professor Attahiru Jega on January 24, 2015 indicating that polls would hold on February 14, 2015. The timetable also scheduled the governorship and State House of Assemblies Elections for 20th February, 2015. The Nigerian Constitution provides for elections to hold not earlier than 150 days and not later than 30 days to the end of the incumbent’s tenure. Asked whether the early release of timetable for 2019 elections would not heat up the polity, Chief Press Secretary to INEC chairman, Rotimi Oyekanmi told our reporter that it was rather intended to put every stakeholder on notice so that all issues bordering on the 2019 general elections would be properly addressed. “It will certainly not heat up the polity. I think INEC should even be commended for taking this bold step. Don’t forget the 2019 elections are less than 500 working days away”, Oyekanmi said. Meanwhile the Commission said it has suspended 23 Electoral Officers who were indicted of bribery allegations following the conduct of the Rivers rerun parliamentary elections. Soyebi said the decision was sequel to INEC’s receipt of a report from the director of Public Prosecutions of the Federation confirming that 23 Electoral Officers indicted over investigation into the December 10 Rivers rerun elections have been charged to court.